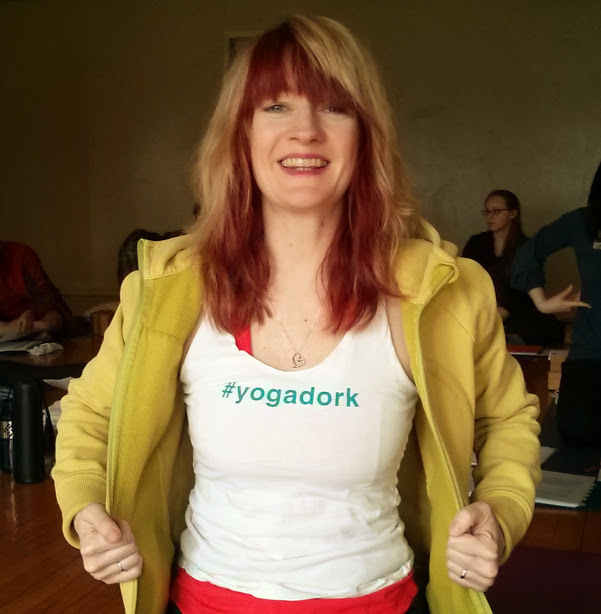 This post is by English professor and yoga teacher, Aimee Morrison. You can find Aimee teaching a rocking drop-in Expanding Flow Class every Sunday at 7:45pm starting in May! Before class, I changed my shirt–I was just reviewing my lesson plan and I could see that what I was wearing was going to work against my teaching. In class, I got a student to come to the front of the room. We linked arms and sat waaaaay back. People partnered up and swayed together. Obviously, this was an “Introduction to Yoga” class, not a “Digital Photography–Writing the #Selfie Online” class. These are the two courses I’m teaching this term, one to 11 graduate students in the English department, and one to 16 beginning yogis at Queen Street Yoga. My two classrooms are about a block and a half away from each others–in fact, I can see the yoga studio from the design classroom, and vice-versa–but they are worlds apart in how I experience them as a teacher. I’ve written a lot about self-presentation as a teacher before: looking “professional”, from head totoe, and mostly about manifesting a particular kind of ethos and authority, where I want my embodiment to be, let’s face it, functionally invisible. I don’t want people to look at my body or my face the way we are all conditioned to look at women: as potential sexual conquests or rivals, as things to be looked at and assessed. When I’m teaching English, I want to look “nice” and “stylish” so far as matches some sort of sense I have of myself (blazers, but with sleeves rolled, and maybe a t-shirt from the internet) without really drawing attention to that as a performance of attention-seeking. I want to fall somewhere being effortlessly professionally cool and recognizably just myself. I often have an acute sense of myself as open to bodily scrutiny even as I try to focus on putting my ideas and teachings forward–this is particularly true in undergraduate classrooms where I stand at the front of the room in front of rows of seated students, where I frequently turn around and write things on the board and can’t see what they’re doing. This is uncomfortable and it often feels like I’m looking for a magic solution to make my self-presentation–my embodiment in the classroom–both acceptable and invisible. It’s a kind of awkward and self-conscious self-denial. I note this particularly since I’ve begun teaching yoga. I teach beginners, and I teach intermediate and advanced students. I teach people older than me, sometimes by a lot, and people younger than me, sometimes by a lot. I teach people whose bodies do not much resemble mine, and some whose do. I teach students who are stronger and more flexible than me, and students who are weaker and tighter than me. Through it all, we bring our bodies to the forefront. I choose my clothes so that students can see my body move and align in particular ways when I demo poses, or mirror them in a flow. Sometimes we try things together: let’s all do this with our left arm, and I’ll do it with you. I’m totally unselfconscious about this. My body feels right, even in its forties, even lumpy and full of moles. My body and my ideas and my teaching work together. I feel whole. “Look at the angle of my pelvis,” I ask them from downward dog, “see how I point my tailbone up to the ceiling here? And what happens to my low back when I don’t?” Or, in Firelog pose, “You’ll see that my leg doesn’t go very far here: I have very tight hips, but yours might be more open and your knee will get closer to the floor.” My body becomes a functional thing, a purposeful thing, a beautiful machine that is fully me, for the moment unlamented. I’ve never felt so unified, and I’ve never felt so complete and so capable, even in my idiosyncratic frailties and my imperfect embodiment. I feel like I’m using my whole self, not squashing a big part of myself away from view, a potential liability to me and my goals. It feels good; it feels weird to feel good in this way. I begin, more and more, to wonder what I lose the rest of the time, when I’m so self-conscious, fighting myself, trying to hide away everything but my Brain. Aimee Morrison completed our 2014 Yoga Teacher Training Program, and now teaches at QSY. When she’s not at the studio, she is teaching Critical Media Studies at the University of Waterloo, having fun with her daughter, or taking selfies on her phone after runs in the rain.